The HouseTrip landing The HouseTrip landing. 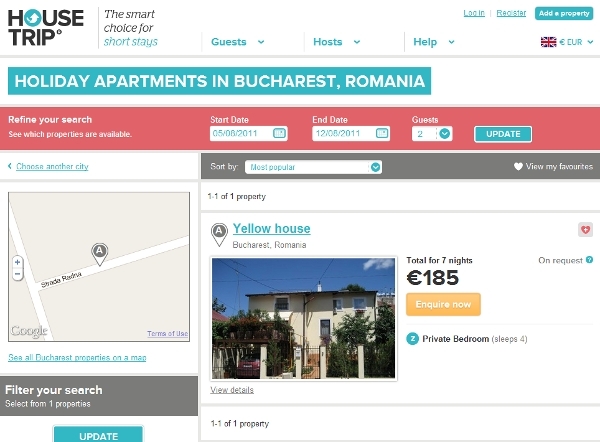 ﻿HouseTrip.com is a European holiday apartment booking portal with some novel and useful concepts going on. What’s going on basically, is a digitalized execution of your family booking the old beach house for Summer vacation, rather than forking it over for a hotel room. Baby Boomers will fondly remember those strange houses at say Sarasota, or Miami maybe, where Mom and Dad used to load everyone up in the car and head off to wonderland. Even if The Wonder Years does not chime your memory bells, saving a ton of value probably will. 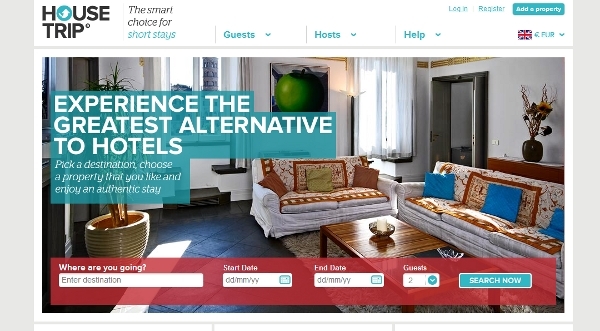 Like HomeAway, HouseTrip affords clients a very nice booking experience. Somewhat stunning in design, the HouseTrip site is a pleasure to navigate. All the bells and whistles, nicely packaged in a minimalist design. Great colors, images, and navigation aids, map aspect, and etc. are all in place. On to the practicality testing, I noticed the first weakness in the portal almost instantly. Limited inventory. As we focus on Eastern Europe, it is only natural to check all those places we hammer Expedia and the others for not engaging – and Bucharest is an all time top pick for being overlooked. So too, HouseTrip offers but one apparent listing. A city of millions, a major capital, and there’s one apartment to let for vacationers? I’ll move on to Varna, Bulgaria, we have to be fair. Opps! No I won’t HouseTrip does not know the jewel of the Black Sea. Okay, now we’re moving along, Budapest has like 92 choices, not too bad. 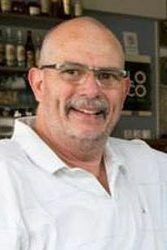 Not really looking for problems, I immediately notice that HousTrip’s images are lacking, in part because the service providers have sucky images, and in part due to the platform’s way of displaying them. Aside this “picky” pet peeve of mine, more investigating proved the real usefulness of HouseTrip. See below. The apartment listing above may not seem extraordinary at first glance. And €1200 euro for 7 days does not ring my bells for bargains initially either. 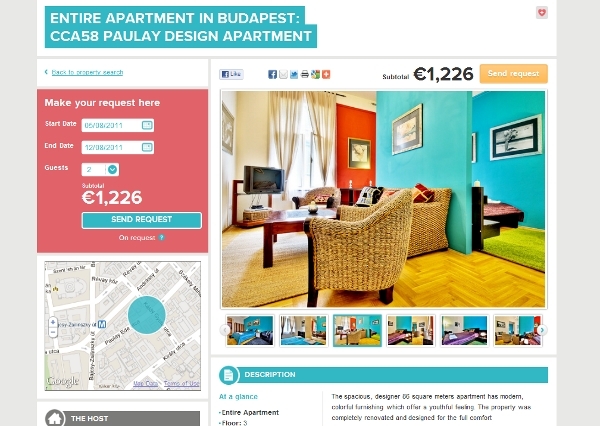 Interestingly though, in our work for Stay.com, creating upcoming neighborhoods in places like Budapest, HouseTrip’s little offering here grows more interesting. Located smack dab in the middle of this wondrous city’s Erzsebetvaros district, two bedrooms, plasma TV, and the privacy of your own flat makes this a bargain. Le Méridien Budapest is a block away and two bedrooms on the low end would be about €1400 euro for the same stay – and not home features. A block and a half away, the Five Star Kempinski Hotel Corvinus Budapest – for 2 suites that compare in size and bedrooms – would set the weary traveler back about €4000 euro. 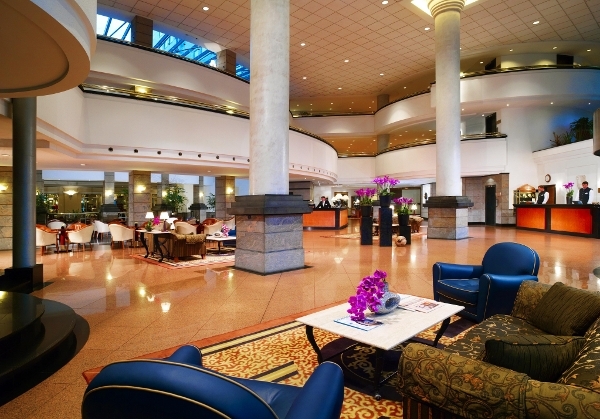 Of course the Kempinski is a whole other world, but you see my point. When it comes down to it, I want the option HotelTrip is offering. Not to mention this flat is located near some of the best kosher spots to eat in Eastern Europe, in the famed Jewish Quarter of Hungary’s capital. Founded by Swiss entrepreneur Arnaud Bertrand back in 2009, the startup has offices in Switzerland, the UK, and in Portugal. The bottom line on his innovation is pretty simple actually. Slick UI and simplicity are good differentiators for Bertrand and his team – but inventory and the credibility of that inventory are a win-lose for HouseTrip. Put bluntly, if I can trust (learn a lot about) these digs in far away places, saving some bucks and value, and trust Bertrand’s company – I am buying the concept hook-line-and-sinker. So will many. These apartments may not be the Kempinski Hotel Corvinus, but everyone is not John. D. Rockefeller either. Lastly, think about Moscow as a for instance case, monetization wise that is for Bertrand. We know from our own research in our development of Argophilia Travel, hotels in Russia are out of their minds price wise, apartments have always been at least the business solution. Check out the pitiful competition HouseTrip has from Welcome to Russia (the most underdeveloped killer domain in history). HouseTrip has a pitiful 7 listings in Moscow, but interestingly, Welcome to Russia only has 43 after all these years online? My take on HouseTrip? They have a real shot, but no more mistakes. Hint, hint, there’s a massive market under there somewhere. Phil out for now.